Please submit an inquiry for more information on your special day or scroll down for frequently asked questions! Our lawn is the perfect setting for your ceremony—lined by Christmas trees and complete with a custom made gazebo--to frame your matrimony. We provide (300) white wood chairs for up to 150 guests and the arbor at no additional charge. 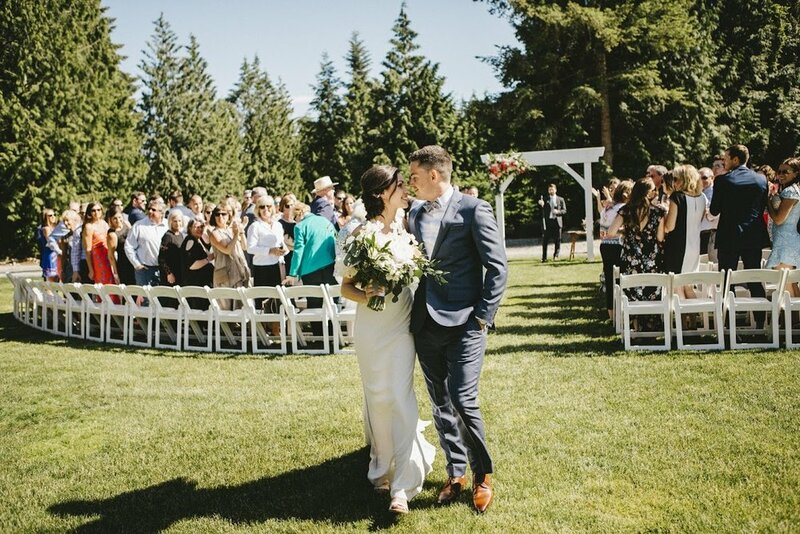 The ceremony lawn is within easy access of the barn for your MC, DJ or Band to set up AV for both your ceremony and reception. The Barn at Trinity Tree Farm is a gorgeous 4500 square foot space--under twinkle lights and chandeliers, perfect for celebrations of up to 150 guests. There is an outdoor fire pit for cocktail hours and relaxing post-dinner with built-benches for an ambient lounge area. There is also a second fire pit, which can be used for roasting marshmallows and a campfire-style bonfire, should you desire. Neighboring the barn, Trinity Tree Farm houses an authentic log cabin perfect for hair and makeup preparations. There is a private bathroom and kitchenette area, and blinds for privacy on all of the windows. Our loft is a sleek 1000 square foot space—complete with a pool table, shuffleboard and stained glass balcony overlooking the property. This cozy area gives the wedding party space to relax before all of the celebrations and can be opened up for everyone to enjoy during the reception. Weddings at Trinity Tree Farm include one pre-arranged hour prior to your wedding for a ceremony rehearsal; private day of usage of the venue from 11:30AM-11:00PM, round tables and white padded chairs for up to 150 guests and complimentary parking for all guests. Please contact Brittny Jarman at bjarman@trinitytreefarm.com for current pricing and availability. Our prices range from $2500 for a non-peak half day rental during the week to $6600 for a peak Saturday. Please note we are also closed for weddings during our Christmas Tree Season, which is mid-November through March 1. Bookings and tours for events and weddings will take place on open house viewing dates, or if those times don’t work for you, please contact Brittny at bjarman@trinitytreefarm.com to schedule an appointment. Please note private tours will be based on calendar availability. We do not permit drop in visits out of respect for clients hosting events at the venue. Our capacity is 150 guests for a seated reception in the barn. We have up to (300) white padded chairs for the lawn and barn, and tables for up to 150 guests. Our 15 round tables are 72” and our 10 rectangle tables are 6’x3’. We have 300 white padded folding chairs to place 150 on the ceremony lawn and 150 in the Barn. We have 15- 72” round guest tables (seat 10 at each table), 10- 6’ banquet tables (seat 6-8 at each table) and for extra use tables (head table, guest book, DJ, buffet (2 recommended), and a cake table. We also 3 “crate” tables for extra use and cocktails (3’ x 3’ x 3’). Planning visits for special events and weddings will take place on open house viewing dates, or contact Brittny at bjarman@trinitytreefarm.com to schedule your appointment. Please note planning visits will be based on calendar availability. We do not permit drop in visits out of respect for clients hosting events at the venue. Vendors who require site visits are required to attend open house dates. Do you have a Day of Coordinator? We have three coordinators onsite who provide rehearsal and day-of-coordination ($1250), based on availability. One of them is a florist as well! Contact Brittny at bjarman@trinitytreefarm.com for more details. A member of our staff will check you in in the morning for setup and give you a contact number should any issues arrive. From one hour prior to your event start time, there will be a venue manager onsite for any questions or needs during the event. The venue manager is not involved in wedding day logistics. We require a damage deposit of $500. This is requested as a separate check or credit card authorization and will be shredded after the event has been held and inspected from any potential damage and returned to its original state. In the event of a cancellation less than 90 days prior to the event, all payments made to date are non-refundable. In the event of a cancellation of the special event greater than 90 days prior to the event date, only the deposit will be due. The licensed use period will commences at 11:30 am and ends at 11:00pm, inclusive of preparation activities such as set-up and delivery time and clean-up activities. We include a one hour rehearsal or walk through in the venue rental to be arranged at a time when the farm is available (these typically fall on Thursdays between 4pm-8pm, and the date and time are confirmed one month prior to your wedding). Please work with your Special Events Manager to arrange this. How many rows of chairs do you set up for the ceremony? How wide are the chairs? How wide is the aisle? We usually set up 6 curved rows of chairs (about 7-19 chairs in each row) with an aisle in the middle. Each chair is about 1 ft. 6in. wide and we leave about 8 feet of width for the aisle itself. You are welcome to change the setup, however you must return it to the original chair setup after your event. For an indoor ceremony, we do 6 chairs on each side of the aisle and rows will depend on your guest count. The measurements are six feet wide, seven feet tall and six inches deep. We do not provide linens, but our preferred caterers and rental companies do. Recommended sizes for linens: 72” rounds: 132” and 6’ banquet tables: 90” x 132”. The crate tables do not require linens. We ask that you use thumbtacks or zip ties to secure your decorations. Any decorations that need to be staked into the ground must be pre-approved by our Event Manager in order to protect the sprinkler system. Our Event Manager will send you a pre-wedding checklist a month prior to your wedding, so we are aware of your plan and can make your day seamless. We allow flower petals for throwing items, however you are responsible for cleaning them up and leaving the venue in its original condition (not included in the garbage fee). Artificial and large petals are recommended. Any other throwing items need to be approved by TTF. Ceremony speakers must point away from the building, toward the bridge, and we ask that it is moved to our designated music area (with ample power) after the ceremony. Music shall conclude no later than 10pm. All AV including a microphone, speakers and projector will be provided by a DJ, Band or rental company. There are power sources that will bear a sufficient load for your event and we have a specific power outlet that is sufficient for your Band/DJ in the barn. Amplified music is permitted on the lawn for the ceremony only and then will be moved to the designated area inside. The barn floor is suitable for dancing without laying an additional floor. Candles must be dripless and used in a manner that does not create a fire hazard. Fireworks are not permitted on the property. Sparklers are permitted only if one of Trinity Tree Farm’s Day of Coordinators is present during your wedding. What is your policy on catering? Do you allow food trucks or grills? What does your catering kitchen include? We have one residential size oven, a full fridge and a double commercial sink for your caterer to use. Caterers are responsible for bringing their own commerical heating equipment should they require it. There is also a small kitchen in the Log Cabin and one mini fridge in the Loft. You can change over the barn if it's raining from your ceremony to reception. The Barn is divided into three parts by posts. We set the tables up on the outer portions of the posts and set chairs for those seats facing forward and also fill in the middle area with chairs to create an aisle before you check in. When your guests move to cocktail hour, we encourage movement to the loft and patio areas, and during that time your party or caterer would move in the remaining tables. It doesn't take more than 15 minutes to do so as long as your table decor is simple. If you expect it to rain on your wedding day, we recommend having Trinity Tree Farm’s Day of Coordinator onsite to make this process run smoothly. We have heat in all areas of the venue. We have A/C in the loft and the cabin. All of the doors of the barn open, and we a large commercial fan if needed for summer months. Do the twinkle lights and chandeliers stay up in the barn? We have rustic log slices that can be used for your centerpieces and accent tables at no charge. We do not keep specific inventory, but there are typically 15 of these for use and they are about 1.5 feet in diameter. We also have two 10-gallon galvanized silver buckets for icing non-alcoholic beverages. Trinity Tree Farm is dog-friendly! We just ask that you clean up after your furry friends! We have a designated smoking area for guests (this includes vape pens). We follow Washington State law for smoking items allowed on the property. A. Washington State requires a banquet permit. The cost is $10 for the day and can be applied for online here: http://liq.wa.gov/licensing/banquet-permits. Please send a copy of your permit to our Event Manager two weeks prior to your wedding with your final paperwork. We allow all types of drinks, and ask that you have a licensed bartender from our preferred list serve them at your event to guests 21 and over. Please no self-serve bottles of alcohol on tables. We have one keg fridge for use (any additional kegs will require a hand pump, tub and ice). It fits a full size keg (half barrel) and smaller (quarter barrel). We have two wine fridges available as well, all included in the venue rental fee. We do not have an ice machine onsite. The nearest convenience store for ice is Tiger Mountain Country Store (14331 Issaquah-Hobart Road Southeast, Issaquah, WA 98027). Generally, 15-20 bags is enough for your event. We have a freezer to store them in, and a large cooler for your bartender is very helpful. What does cleanup and check out look like? Trinity Tree Farm will take care of the setup and take down of tables and chairs and handles the deep clean (mopping floors, sanitizing countertops and cleaning restrooms). We also have your tables and chairs set up for you upon arrival to the venue. Removing of all waste from your wedding from the property (all leftover glasses, napkins, s’mores skewers, send off items, cigarettes, etc.). We have trash bags and cleaning supplies onsite. If you would like our staff to handle all of the garbage, we can do so at the end of your event under the garbage fee, which is $350. Leaving the kitchen area your caterer found it (clean surfaces, fridges, sinks, and food service areas). Log Cabin: All items removed, kitchen cleaned if used. All cars must be off of the property by 10am the following day. Uber and Lyft service our venue!